After finishing our packing, on which we’d gotten a good start last night, we enjoyed another good breakfast at the hotel. Picked up by Gabriela and our driver at 8:30 and arrived at the airport two hours ahead of time for our 11:15 flight. We’re sitting here in a modern, but not very well air conditioned, airport. I ask Carol whether she thinks there’s early boarding available for people who are impatient. She says I can try. 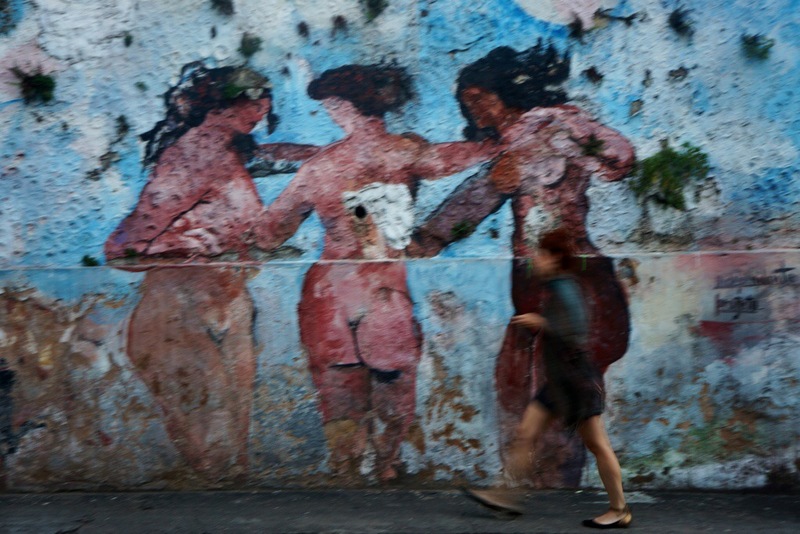 Some reflections on our time in Salvador. It was not what we expected. We’d gone there because of the strong African influence and, while we understand that and saw and heard some of it, we did not really feel it the way we’d anticipated. Part of this may have been the poor timing for seeing the Candomble religion in action. Undoubtedly, too, our experience was colored by Carol’s necklace having been stolen, after which we were constantly on the watch. Gabriela and others warned me about my camera, so I wore it around my neck and kept a tight grip on it. On the other hand, one can argue that this adverse experience was a dose of the reality of Brazil. And there certainly were aspects of our days here that were great–meeting Rodrigo and Fernanda, the Calafeta social project, the ballet folklorico, traversing the streets of the Pelourinho in the pouring rain with Gabriela, some very good food, the church experiences–so it was far from a total loss. The Pelourinho area holds considerable charm, but also a certain unreality. Rodrigo told us that, while Fernanda had lived in Salvador her whole life, she’d really only been to the area (other than to eat at some good restaurants) two times. So staying where we did was probably not experiencing the real Salvador. Rio is the capital city of the State of Rio de Janeiro, the second largest city of Brazil, and the third largest metropolitan area and agglomeration in South America. There are approximately 6.3 million people living within the city proper, making it the 6th largest in the Americas and 26th in the world. It is the only state to be bordered by all the other states in the same macroregion. These are Minas Gerais, Espírito Santo and São Paulo. It is also bordered by the Atlantic Ocean. This state has a total area of 43 653 square kilometres. Although originally inhabited by native tribes, Rio de Janeiro is considered to have been ‘discovered’ when Portuguese explorers encountered Guanabara Bay on 1 January 1502. The name Rio de Janeiro means “River of January”, and is based upon finding this destination on this date. It would be some 53 years later that one of the islands of Guanabara Bay was colonized and occupied by 500 French settlers. Today, this island is known as Villegagnon Island. Then, on 1 March 1565, the Portuguese established the city of São Sebastião do Rio de Janeiro, while Guanabara Bay was called Rio de Janeiro. During the 1600’s, Rio became a convenient port for the transport of gold and precious stones. For this reason, the colonial administration was moved to the area in 1763 from Salvador. In 1808, the city saw an influx of Portuguese royal family and associated Lisbon nobles, who were escaping the Napoleonic invasion in their homeland. These Portugese ousted those who were occupying homes and territory within Rio to take over their established abodes. With these noblemen and royals came hundreds of thousands of slaves, who crossed the ocean from Africa. In 1808, when the Portuguese Royal Court transferred itself from Portugal to Brazil, Rio de Janeiro became the chosen seat of the court of Queen Maria I of Portugal, who subsequently, in 1815, under the leadership of her son, the Prince Regent, and future King João VI of Portugal, raised Brazil to the dignity of a kingdom, within the United Kingdom of Portugal, Brazil, and Algarves. Rio stayed the capital of the monarchy until 1822, when the War of Brazilian Independence began. It subsequently served as the capital of the independent monarchy, the Empire of Brazil, until 1889, and then the capital of a republican Brazil until 1960. Rio de Janeiro represents the second largest GDP in the country (and 30th largest in the world in 2008), estimated at nearly US$201 billion, and is headquarters to two of Brazil’s major companies—Petrobras and Vale, and major oil companies and telephony in Brazil, besides the largest conglomerate of media and communications companies in Latin America, the Globo Organizations. The home of many universities and institutes, it is the second largest center of research and development in Brazil, accounting for 17% of national scientific production—according to 2005 data. 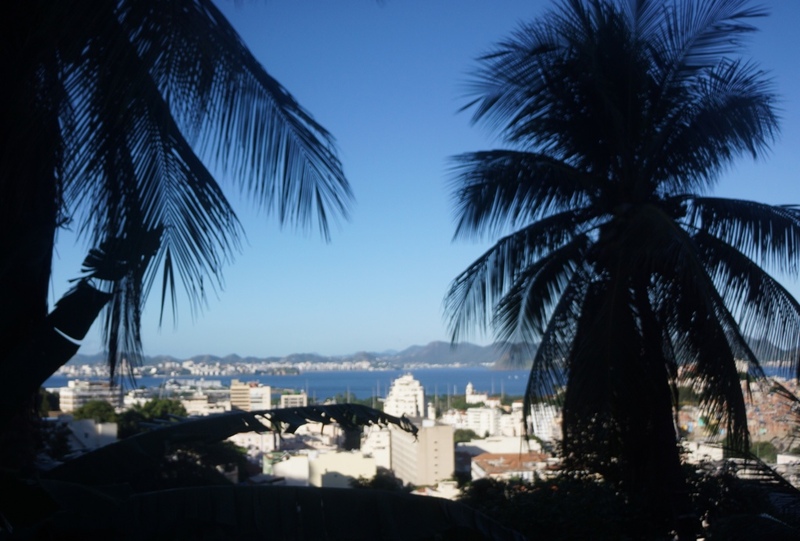 Rio is one of the most visited cities in the southern hemisphere and is known for its natural settings, carnival celebrations, samba, Bossa Nova, balneario beaches such as Barra da Tijuca, Copacabana, Ipanema, and Leblon. Some of the most famous landmarks in addition to the beaches include the giant statue of Christ the Redeemer (“Cristo Redentor”) atop Corcovado mountain, named one of the New Seven Wonders of the World; Sugarloaf mountain (Pão de Açúcar) with its cable car; the Sambódromo, a permanent grandstand-lined parade avenue which is used during Carnival; and Maracanã Stadium, one of the world’s largest football stadiums. Rio will be one of the official Host Cities of the 2014 FIFA World Cup, and its Maracanã Stadium, which held the final of the 1950 FIFA World Cup and 2013 FIFA Confederations Cup, will host the final match of the 2014 FIFA World Cup. In 2016, Rio de Janeiro will host the Summer Olympics and the Summer Paralympics for the first time a South American and Portuguese-speaking nation will be hosting the event. It will be only the third time the Olympics will be held in a Southern Hemisphere city. We’re about an hour late. Rio looks beautiful, mountains on one side, water on the other. A tremendous amount of work is being done, some of it in preparation for the World Cup, and major stuff in preparation for the Olympics. The old waterfront is being completely rebuilt and roads moved, so that we are routed through the downtown area to get to Santa Teresa, where our hotel/guest house is located. Fortunately, the tour I’d thought we were doing this afternoon had been switched to another day, as we would not have had time to do it. 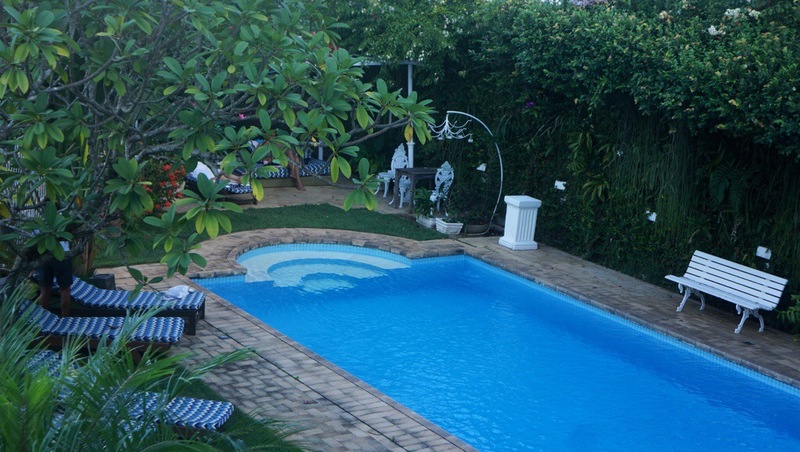 We are staying at the Mama Ruisa, a colonial-style hotel located in Santa Teresa overlooking the Bay of Botafogo, 30 minutes from the airport, 15 minutes from Copacabana and Ipanema, and 10 minutes from the historic centre. The French-run property has only seven rooms, all with exclusive decoration, and serves breakfast on the verandah overlooking the bay. Okay, so that’s the stock description of the place, but doesn’t come close to describing how lovely it is. Gorgeous, huge room with bath, shower and walk-in closet, spacious living room with great art work, fabulous views, pool and garden area, wifi. (The photos below won’t do it justice, either.). We may never leave this place. We took a walk up the hill from our guest house to the main street, which feels funky and a little Bohemian. There are a number of small restaurants, bars, arty stores, etc. 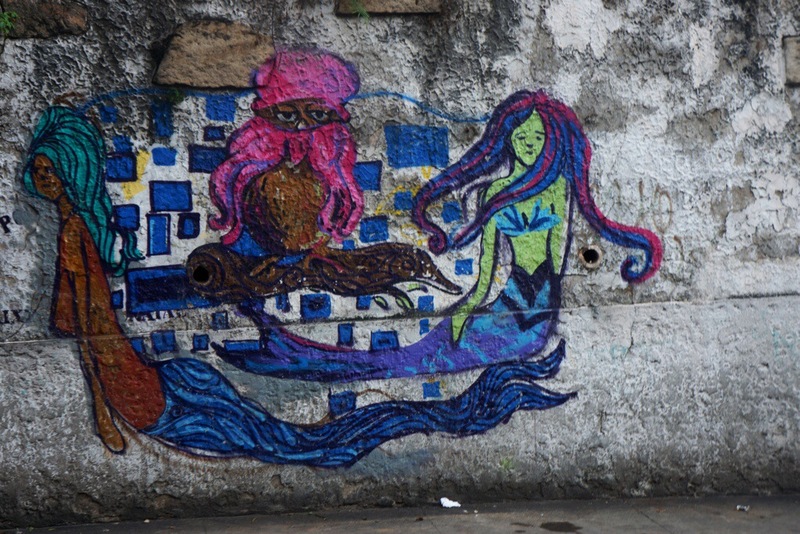 As was true in Salvador, murals line many streets, though they appear to be less polished, if that’s a word that applies to graffiti, than many we saw in Havana. We wound up stopping for a small snack at what turned out to be a movie theater. There we had a long conversation with a young European woman who is building a house in Santa Teresa, but whose 7-year old daughter is in Italy with her husband. She’d lived in London and other places, and spoke articulately about the shortcomings of Brazil, including infrastructure, education, corruption, health. She described it as chaotic, but, at the same time, clearly has a love for the country. Returned home and made arrangements to have dinner with Rosa (more below) and cleaned up and rested a bit. 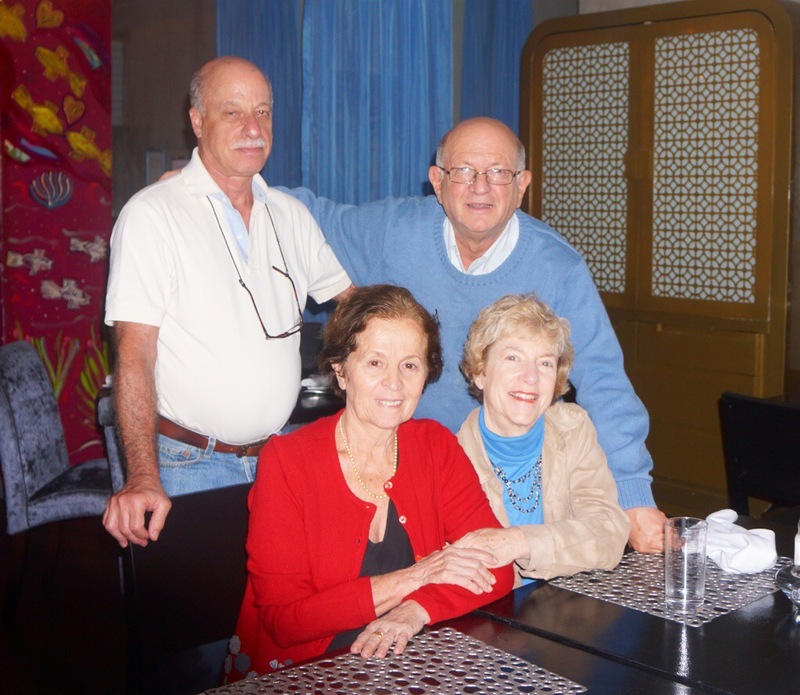 We met for dinner with a pediatric cardiologist who is a good friend of our close friend, Mike Freed. Rosa Barbosa took a 6 month sabbatical in Boston, where Mike is a pediatric cardiologist at Children’s. Rosa has set up a foundation and a cardiac hospital to take care of indigent children with congenital heart disease in Rio. Great time with Rosa and her husband, Paul, who is a retired economist. Rosa’s dedication and drive for the work she does is amazing. Her diminutive size notwithstanding, one underestimates her at their own peril. After dinner and two delicious caipirinhas, a typical Brazilian drink that they introduced me to, we taxied back to our guesthouse. Carol is absolutely beautiful. Wow! Wonderful to share this with you. Very colorful………..love the photos, too! I read the blog before I begin work everyday Arnie. It’s really great, and I find your travel blog so refreshing. Love the photos I am seeing, but tell you what, we relished seeing you and Carol together in the same frame…. You guys look great. I’m glad Gabriela warned you about your camera. Have you gone swimming yet? If I’d been there, I would have buged you to see if I could go swimming. Have a good time in Rio! See you soon! WOW! Those pictures are beautiful! I wish I was there to be in the Olympics. I can do a great forward roll! I know in subsequent posts (which, for me, are previous posts, since I’m reading backwards to catch up), you have a couple of pictures of you and Maz that place you in the beautiful and exotic setting you’re in, which I know is largely the point. But, especially because you were recently asked for a photo of you and Maz together and it came to our attention that you didn’t have an up-to-date one, I think you should also get someone to snap a few close-ups of just the two of you. You could each hold one side of a sign that reads: You should get a hold of the scenery behind us here in Rio!